Despite the disappointing end to his involvement with the company that he had founded, Bill Freeman worked in the publishing industry for the rest of his life. Post Freeman & Co., he stayed with his new employer, Addison-Wesley, long enough to regain a sense of confidence. With his wife Margaret, he then set about establishing his second independent press: Freeman, Cooper & Company, a name that once again incorporated the Freeman brand, but now also included Margaret’s maiden name. Rather than limiting the scope of their new firm to a specific discipline as Freeman had done in the past, Freeman, Cooper & Co. published books on a wide range of subjects. While Bill Freeman was still primarily interested in publishing textbooks, he shied away from entering into direct competition with his previous company. As a result, his new venture published books for academic use that were not, strictly speaking, textbooks. And while science remained a key area for the publisher, other areas including psychology and philosophy also began to populate the catalog. Though Freeman relished the fresh start, he still recognized the value of retaining past connections. Key among these connections was illustrator and close friend Roger Hayward, whom Freeman approached with a few project ideas in 1971. The first of these ideas was a book that he hoped Hayward would write on “the simpler and fundamental geometry of nature,” intended for use by both introductory and advanced students. He also proposed that Hayward illustrate a different book on crystallography for chemists, and a third book focusing on the chemical elements. Hayward expressed interest in these projects, as long as Freeman could pay him royalties. Freeman agreed, but warned that the royalties might be small because the audience for each project was likely to be rather specialized. For Hayward, this was a risk worth taking, given that his royalty income from other projects was robust enough to absorb a potentially low payout from these new ventures. 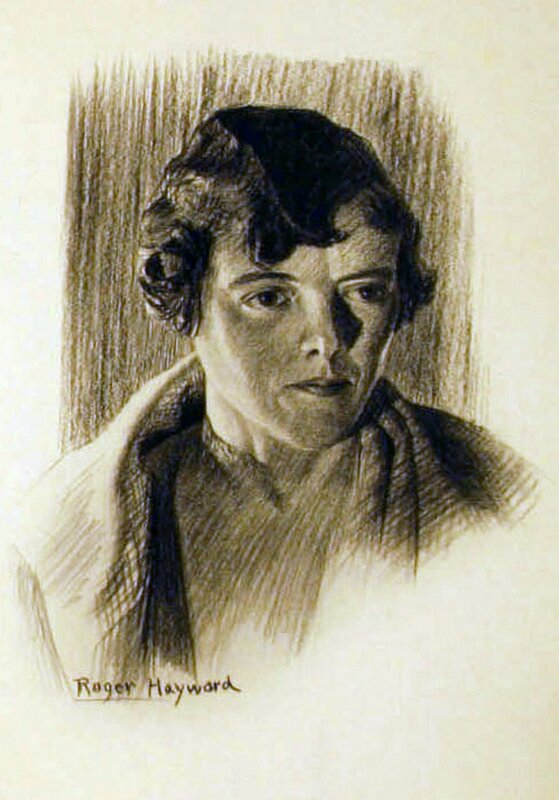 Having arrived at this understanding, Freeman’s only additional request of Hayward was that he not complete illustrations for any rival publishers. This was also an easy request to fulfill as Freeman, Cooper & Co. were engaged in direct competition with only a few other firms. Their agreement in place, Hayward set to work on new illustrations and an early draft for his geometry of nature book, contacting Freeman regularly to keep him apprised of his progress. By this point in his career, Freeman no longer held his authors to strict deadlines, so long as they did a good job of staying in touch. In their exchange of letters, Freeman provided gentle guidance to Hayward as he developed his text. When Hayward broached the idea of including anecdotes from his personal life in the book, Freeman expressed reluctance. And while he ended up telling Hayward to proceed, he advised caution: too much autobiography could harm an author’s academic authority, he felt, though the right amount of personal narrative could work to forge a deeper connection with students. Drawing of a Cooper Structure as published by Ruth Walker in October 1973. Once Freeman had piqued Hayward’s interest with these smaller projects, he unveiled the idea that he was most excited about, an organic chemistry manuscript by Ruth Walker, a chemist at Hunter College. Hayward enthusiastically agreed to provide illustrations for the text, but soon became enmeshed in a familiar set of struggles: when Walker raised concerns about Hayward’s initial drafts, the illustrator refused to make changes. Most of Walker’s concerns were over small or superficial details in the illustrations, but a particularly contentious debate ultimately led to a significant advancement. As part of his portfolio for the Walker project, Hayward had created a paper model of a tetrahedron that was designed for students to tear out and construct into own molecule. While on board with the idea, Walker claimed that the instructions that Hayward had written were inaccurate and that the overall design was ineffective. Unable to resolve the debate themselves, Walker and Hayward brought the matter to Freeman. The publisher was intrigued by Hayward’s unique design, but agreed with Walker that it would be difficult for students to follow the instructions that Hayward had provided. As a means of clarification, Freeman suggested a minor modification – the addition of dotted lines to indicate the direction in which students should bend the model. He also promised Hayward that he would collect more authoritative opinions from accomplished chemists and reconvene with him before the publication of the text. 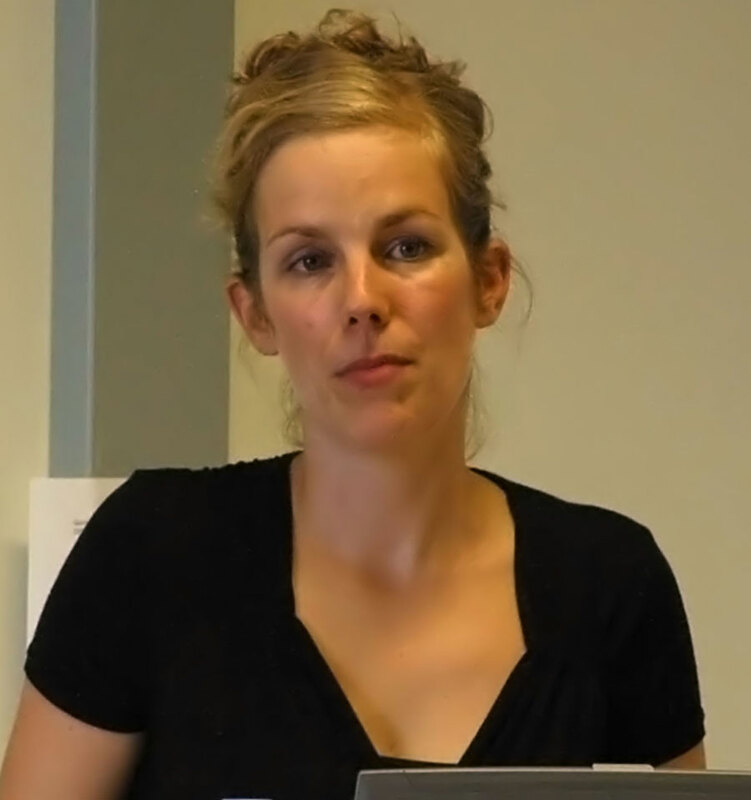 Several of the chemists that Freeman contacted agreed that Hayward’s model was unique and had potential as a teaching tool. When Freeman relayed this feedback to Hayward, the illustrator immediately took steps to patent his design. Freeman assured him that the copyright protecting the material in the book would be sufficient for this purpose as well. Freeman replied that the Hayward Structure was actually the first name that had been proposed, but that the group of scientists couldn’t arrive at a consensus. Some other names they tried included the Freeman Structure, a hopper crystal, a starved tetrahedron (because of the model’s concave sides), an inverted dodecahedron, an instellated polyhedron, a Texas Tetrahedron, and a Cooper Crystal. The Cooper Structure was the name that everyone ultimately agreed upon. Hayward belatedly suggested the HFC Form – for Hayward, Freeman, Cooper – but his suggestion was largely ignored. A unique model for illustrating the tetrahedral geometry of sp3 bonding is obtained when the pattern in the figure is cut out and assembled…the resulting structure is a tetrahedron with four recessed faces and a central hole, and has been named the Cooper Structure. Each face is recessed in such a way as to produce a model that clearly shows the relative position of four bands extending from the center of a tetrahedron, one towards each apex. This model was designed by William H. Freeman for inclusion in ‘Organic Chemistry: How to Solve It (I. Molecular Geometry)’ by Ruth A. Walker, after Mr. Freeman observed models made by Roger Hayward, the illustrator of the organic workbook published by Freeman, Cooper and Co. in 1972. Hayward was somewhat placated by the wording of the article, which let him claim a share of the credit for the design. He proceeded to recommence work on his geometry of nature book, but never finished it as his health problems increased in severity. Meanwhile, Bill Freeman was also experiencing his share of setbacks. Just before the Cooper Structure conundrum arose he was hospitalized for exhaustion, which slowed production considerably and led to a period of prolonged discouragement. 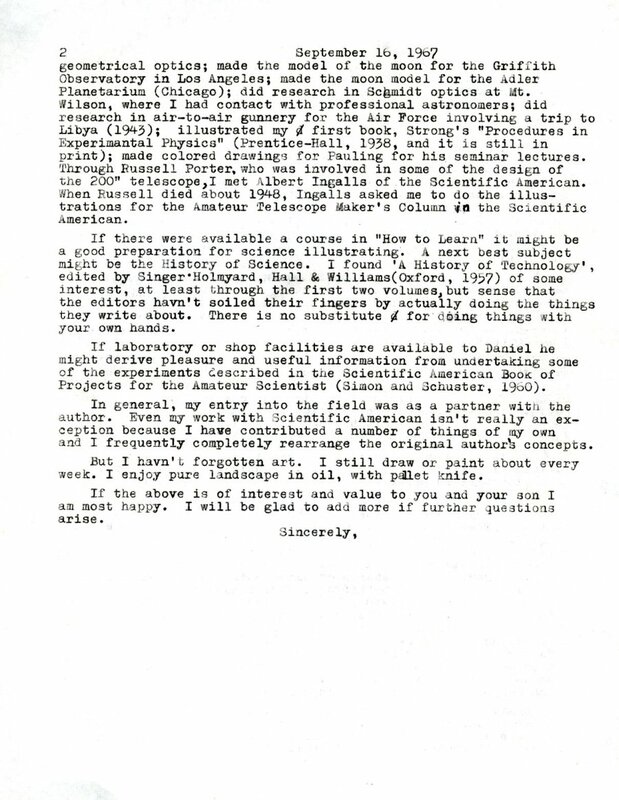 In a letter to Hayward, he made reference to “hurdles, disappointments, problems and shenanigans that I dare not put into print.” And for all the fuss that it caused, Ruth Walker’s book, Organic Chemistry – How to Solve It, sold only 11,000 copies. Over the course of its history, Freeman, Cooper, and Company experienced moderate success, but never achieved the same fame as its predecessor. Many of the authors who had found their niche at W.H. Freeman & Co. remained loyal to the original company even after its namesake had moved on; indeed, with the notable exception of Roger Hayward, Bill Freeman built his new company largely from scratch. He insisted though, that modest successes did not diminish his passion for the independent press. After he passed away in 1992, Margaret took over the firm and ran it smoothly for a few additional years before letting it go to become another piece of publishing history. Roger Hayward at Freeman & Co.
As Linus Pauling’s chemistry series at W.H. Freeman & Co. moved forward, a third member of the team proved to be of crucial importance: illustrator Roger Hayward. 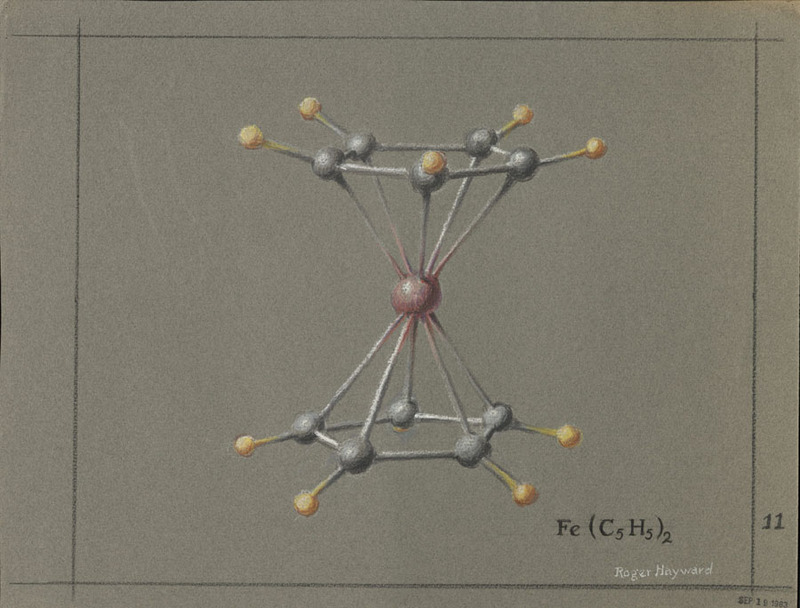 As we’ve covered previously, Bill Freeman initially employed Hayward to create the illustrations for Pauling’s General Chemistry textbook and, suitably impressed, wound up commissioning him for a number of other projects. Freeman quickly saw that Hayward was an incredibly talented illustrator and the two formed a close friendship that lasted through the years. Freeman even recruited Hayward to design his new office when the company moved from Market Street. Freeman was colorblind and admitted that he needed help when it came to outfitting a space. In the past, he had relied upon a “Vice-Presidents-in-Charge-of-Decoration” committee made up of several female colleagues, but ultimately decided that Hayward’s insights were a better fit. In particular, Freeman commissioned Hayward to create an illustration meant specifically to hang in his office. 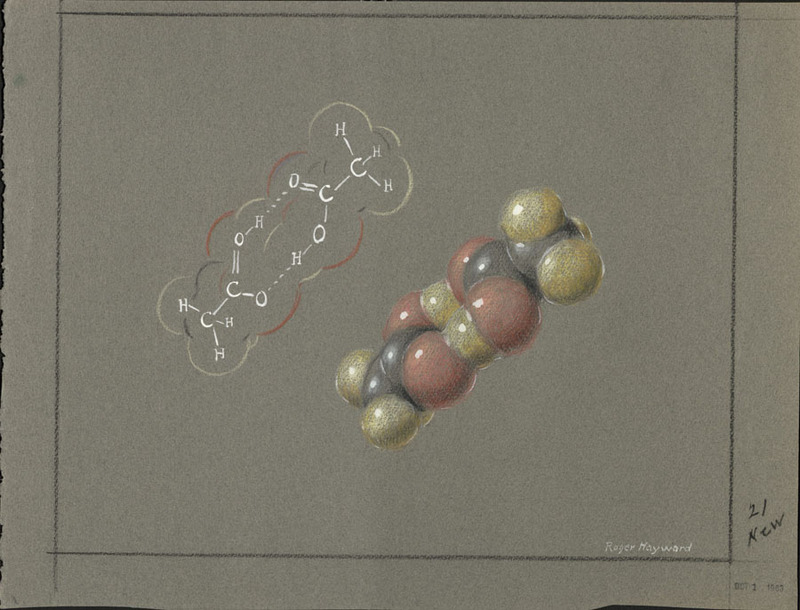 Hayward gladly obliged and, a few weeks later, presented Freeman with a large illustration of molecules that – as Freeman’s staff informed him – were a lovely shade of apricot. A Hayward illustration used in the first edition of General Chemistry, 1948. Professionally, Hayward was a fundamental asset to the company, and in more ways than one. For example, when Freeman was courting John D. Strong, then at Johns Hopkins, for a book on optics, Hayward played a crucial role in convincing Strong to sign with the San Francisco firm rather than a larger publishing house on the East Coast. Once secured, Hayward and Strong worked well together, engaging in lively discussions as they collaborated on the manuscript. No one can copyright an idea. One can copyright the expression of an idea. This last applies, not only to the use of words…but to illustrations as well. Believing that Houghton-Mifflin had indeed committed a violation of this type, Freeman became aggressive. In the end, he negotiated a deal with the president of the company stipulating that Houghton-Mifflin would pay a $0.04 royalty fee to Hayward for each copy sold. Betty and Roger in 1956. Hayward’s value was such that Freeman ultimately thought it wise to offer him a contract with the company, rather than enlisting him periodically as a freelancer. While beneficial to the company, this contract also offered the promise of a steady wage and a new era of financial security for Roger and his wife Betty. The agreement seemed simple on paper. Hayward would continue to receive royalty payments for relevant books published prior to the contract, but for future work, he would receive an annual salary of between $4,500 and $7,500, ($40,000 to $67,000 in today’s dollars) depending on how many hours he logged. And though he would be on salary, Hayward would not be asked to be physically present at the office as long as he kept track of the time that he spent working on projects for the company. The contract specifications were satisfactory for Hayward, particularly because of the royalties language, as continuation of these payments would insure some degree of income for Betty were Roger to pass away suddenly. Indeed, perhaps the most significant benefit of the contract was the health insurance that the company offered to Hayward, who suffered from asthma. Importantly, the insurance agreement stated that Hayward and his family would receive health benefits during the run of the contract and also for two years after any event that led to his incapacitation or death. The only new requirement of Hayward was that he commit to completing illustrations for the exclusive use of Freeman & Co. and a partner publication, Scientific American magazine. Hayward illustration used in Concepts of Classical Optics, by John D. Strong, 1958. After a period of negotiation, Hayward agreed to terms and, in 1958, began working as a contract employee. His first task was to experiment with alternatives to color printing and texturing. While Freeman knew that color printing might help set his firm apart from its competitors, he worried that the costs were too high. With Hayward, Freeman tinkered with screen tone and half-tone techniques, but neither proved especially successful. The boys around here certainly have tried to see that each of us doesn’t have to misuse his talents or have a disproportionate amount of the uncongenial. How in the world could we keep this spirit if we had an exception, one sharing in the perquisites but able to rule (by himself) that he would not do some share of the work because he decided it was uncongenial? But drudgery wasn’t Hayward’s only concern. Increasingly he felt that authors were overly critical of his illustrations and unwilling to give him the respect that he deserved. As Hayward grew more and more unhappy, Freeman found himself spending a great deal of time mediating. This wasn’t necessarily out of character; he often referred to himself as “Old Man Freeman,” a persona of wisdom and benevolence that he felt he needed to embody as director of the company. I see nothing in that [contract] which commits me to the philosophy that the author or any other person is always right. I certainly would never sign a contract which would require me to satisfy any person or persons who are not a party to that instrument. We and our authors are the sole judges of what goes into a book and you legally must abide by that principle or you do not fulfill your part of the bargain with this company. Suitably chastened, Hayward apologized to both Freeman and Pimentel and resumed illustrating. With enough of these conflicts however, Freeman saw that a contract was no longer benefiting the authors, the company, or Hayward. Eventually he offered to terminate the agreement and allow Hayward to revert back to freelance status, receiving additional payments on a royalty basis. Hayward accepted and his relationship with the company, as well as his friendship with Freeman, quickly returned to a mutually respectful and co-productive state. By the end of the 1950s, Roger Hayward had retired from his professional work as an architect at the same time that his career as an illustrator was reaching its peak. And with this came a new measure of security: having worked chiefly as a freelancer in the past, Hayward signed a contract in the early 1960s that helped to solidify his position as a technical artist. The contract that Hayward signed was with W.H. Freeman & Company, a San Francisco-based publishing house that rose out of relative obscurity primarily by publishing Linus Pauling’s hugely popular textbook, General Chemistry. First released commercially in 1948 (with illustrations by Roger Hayward), General Chemistry went through two more stateside editions, the last appearing in 1970. Such was the pedagogical import of General Chemistry that it was translated into at least eleven languages, including Gujarati, Hebrew, Swedish and Romanian. Indeed, for several years Pauling made more money off of royalties from his textbook than he did from his Caltech salary. The impact of the book was similarly lucrative for the publishing house and its success cemented a long and close connection between the Freeman firm and Pauling. For many years W.H. Freeman & Co. had also collaborated with Scientific American, publishing a selection of the magazine’s articles as offprints. Roger Hayward often found himself in the middle of this collaboration as he frequently illustrated publications for both companies. The partnership between the two organizations proved so fruitful that, in 1964, they decided to merge, the hope being that W.H. Freeman might grow into the nation’s leading publisher of scientific texts. The joining of these two companies that he knew so well was a positive turn of events for Hayward, in part because it led to the publication of what would become his most acclaimed work, The Architecture of Molecules. 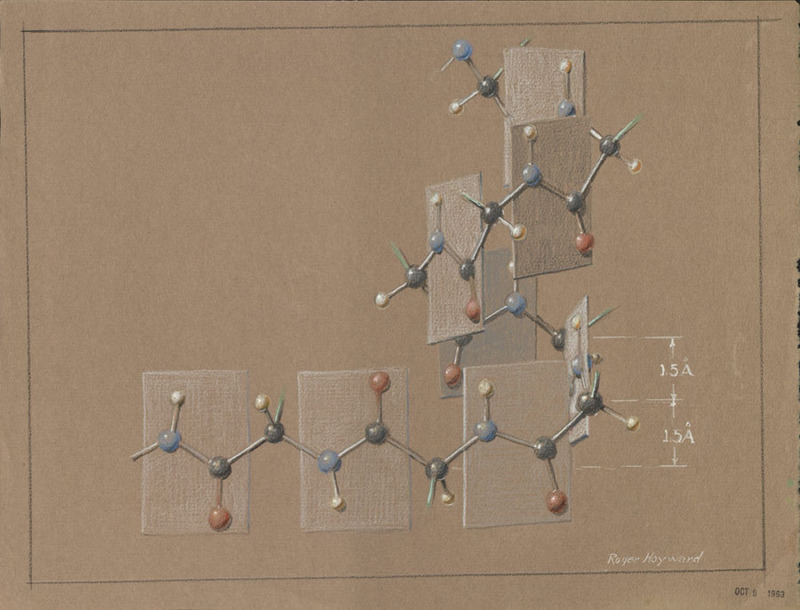 A beautiful and innovative book co-authored with Linus Pauling, The Architecture of Molecules ultimately sold over 15,000 copies and featured some of Hayward’s best-known scientific illustrations. I have just signed up to illustrate a Molecular Architecture book with Linus. The Freeman & Co. are to publish and all the figures are to be in color. I expect something like 75 figures some of which I have already done. The idea behind the new book was to use illustrations to attract audiences from all backgrounds to an informative work on structural chemistry. The volume also represented one of W.H. Freeman’s first attempts to step away from strictly academic subjects in favor of publishing a scientific work marketed to a non-academic demographic. There are two kinds of alanine molecules, which differ in the arrangement of the four groups around the central carbon atom. These molecules are mirror images of one another. The molecules of one kind are called D-alanine (D for Latin dextro, right), and those of the other kind L-alanine (L for Latin laevo, left). Only L-alanine occurs in living organisms as part of the structure of protein molecules. Other amino acids, with the exception of glycine, also may exist both as D molecules and as L molecules, and in every case it is the L molecule that is involved in the protein molecules of living organisms. Some of the D-amino acids cannot serve as nutrients, and may be harmful to life. In Through the Looking Glass Alice said, ‘Perhaps looking-glass milk isn’t good to drink.’ When this book was written, in 1871, nobody knew that protein molecules are built of the left-handed amino acids; but Alice was justified in raising the question. The answer is that looking-glass milk is not good to drink. “My major asset in my work,” Hayward once wrote,” is an interest in and skill in three-dimensional thinking. This is coupled with a great interest in how things are put together both as an arrangement in space and in the physical sense.” In this sense, The Architecture of Molecules nicely summarizes Hayward’s true passions. And in Pauling, Hayward was teamed with a more than capable second set of eyes. Most notably, Pauling’s familiarity with the time period’s cutting edge research enabled him to make suggestions for updates to some of the illustrations that Hayward already had in hand. His urgings also resulted in the inclusion of crystal structures as a more significant part of the book than was originally envisioned. At various points throughout its 120 pages, The Architecture of Molecules also stresses the importance of understanding how the basic principles of chemistry are part of every-day life. Structures like the heme molecule and the alpha helix are therefore presented as exciting examples of newly discovered molecular structures that play a central role in the lives of all beings. After hitting the market late in 1964, The Architecture of Molecules received generally positive reviews, though some critics took pains to point out that the book represented “Pauling’s view of the universe at the molecular level.” At the time, knowledge of the structure of atoms and molecules remained mostly based in theory – microscopes of the era still could not see on the molecular level and x-ray diffraction remained a technique that required years of practice to master – and Pauling’s ideas on chemical bonds, while hugely influential, were not universally accepted. The increased use of x-ray diffraction within the discipline, however, further pressed the need for a compilation of illustrated molecules to be used as a tool for teaching chemistry. Pauling was also a firm believer that students would learn better if they understood the physical characteristics of chemical compounds. 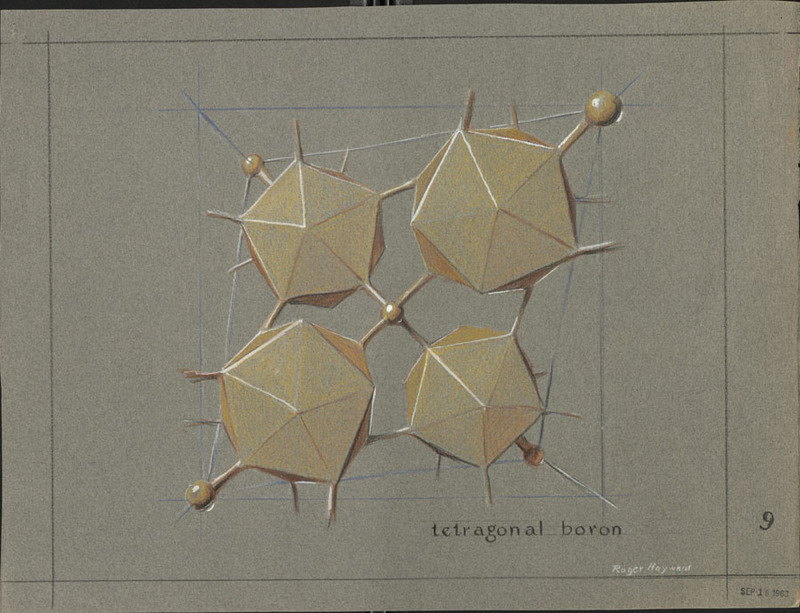 Based as they were in the latest findings, the illustrations featured in Pauling and Hayward’s book represented a contemporary vision of molecular structure. The Architecture of Molecules clearly fit a niche and it sold relatively well – over 12,000 copies purchased in the U.S. and another 3,500 overseas. Part of the book’s foreign gross came by way of two translations; a Japanese version appeared in 1967 and a German edition was released two years later. 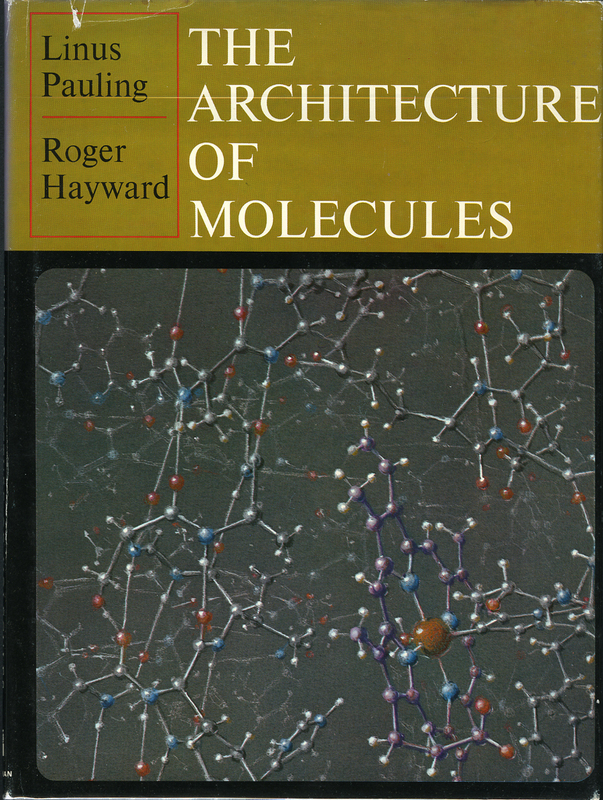 Today The Architecture of Molecules certainly stands as Roger Hayward’s highest profile publication, and arguably his most important. Hayward was a huge talent, remarkable in his ability to combine a desire for scientific development with a strong artistic aesthetic. 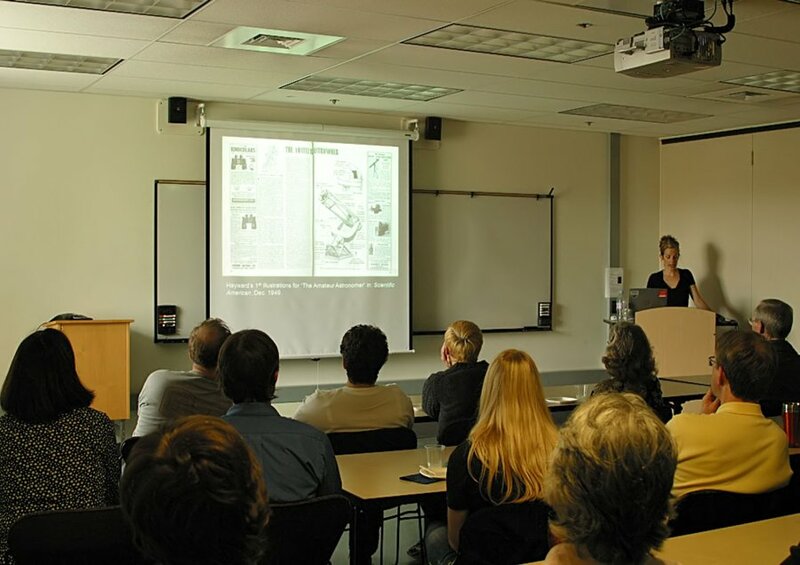 Never formally trained as a scientist, Hayward’s work as an illustrator and as a colleague of some of the top researchers of his time earned for him a permanent place in the history of science communication and education. 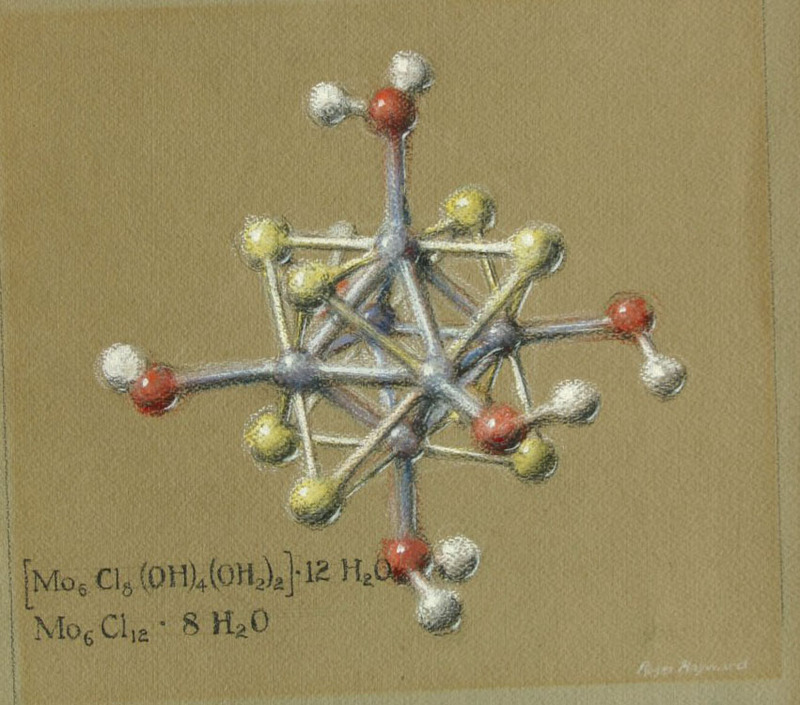 Pastel drawing of the molecular structure of molybdenumdichloride. By Roger Hayward, 1964. It is not unusual to find pictures of Linus Pauling surrounded by three-dimensional molecular models or with drawings of molecules and their bonds covering his work space. Pauling believed that understanding the physical properties of molecules was crucial to understanding their chemical interactions. This guiding principle made Pauling an influential figure in his use of models and illustrations to explain the properties of substances. Pauling’s 1947 textbook, General Chemistry, became a best-seller in part because because it presented novel new methods for teaching chemistry at the undergraduate level. The book incorporated quantum physics, atomic theory and real-world examples in explaining basic chemical principles, and a key feature of the text was that it used illustrations like nobody else had done before. Prior to the publication of General Chemistry, the properties of atoms and molecular bonding were described and taught in such a way that students were required to think abstractly about chemical reactions without a full understanding of the physical interactions that caused these reactions. General Chemistry changed all that. From his high school years through his post-graduate studies, Pauling had experienced numerous approaches to teaching chemistry. Pauling, of course, had been asked to teach introductory chemistry while himself an undergraduate at Oregon Agricultural College, and it was during a similar stint teaching freshman as a graduate student at Caltech that Pauling began to devise a plan for his revolutionary textbook. He was certain that in this new project, illustrations and diagrams would serve an essential role in engaging students and helping them to understand the fundamentals of chemistry. Luckily for Pauling, members of the Caltech faculty had already developed a close connection with an unusually skilled Pasadena artist, inventor and architect – Roger Hayward. His keen ability to illustrate scientific concepts in an accurate and accessible way made him the perfect choice to create the visuals for Pauling’s textbook. 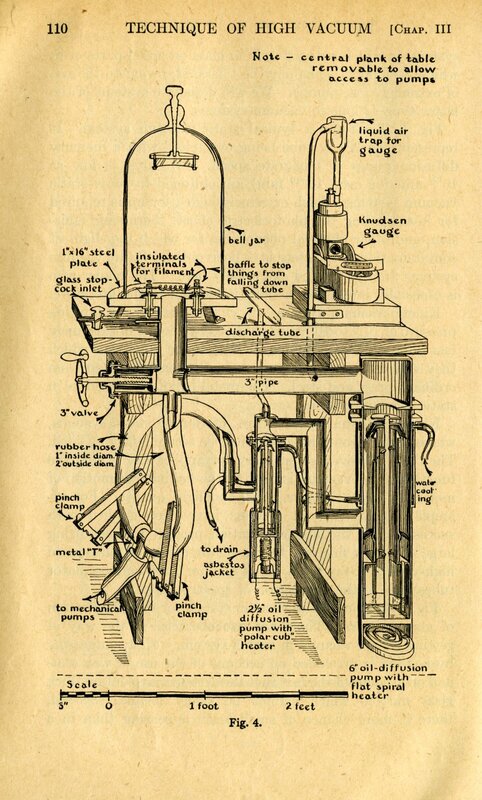 Illustration by Roger Hayward of a high-vacuum apparatus as published in Procedures in Experimental Physics, 1938. A trained architect, Roger Hayward’s career path was unique, to say the least. A recent transplant from the East Coast when the Depression hit, Hayward was forced to expand his occupational enterprises well beyond architecture, as sour economic times dried up the building design market for several years running. While this was surely a difficult transition for Hayward, the period did grant him the opportunity to cultivate his creativity and his talents in many other fields of interest. As he endeavored to make ends meet, Hayward’s artistic inclinations led him to explore broad new avenues, from painting to puppeteering. For a time, he even satisfied his interests in scientific experimentation by performing research in the field of optics and ballistics at the Mt. Wilson Observatory, studies which ultimately resulted in his attaining seven patents for optical devices and procedures. Indeed, Hayward had already made a place for himself in the sciences by the time that Pauling approached him with the offer to illustrate General Chemistry. Aside from his optics work, Hayward had already illustrated a number of scientific publications, including a textbook, Procedures in Experimental Physics. The principal author of Procedures in Experimental Physics was Hayward’s close friend John D. Strong, a professor of physics and astronomy at Caltech. Strong felt comfortable collaborating with Hayward because he was very familiar with his friend’s interests in science and art, and he appreciated his strong aptitude in both disciplines. Procedures in Experimental Physics was a success, and both Strong and Hayward received good reviews for their work. Buoyed by this strong critical reception, Hayward’s continuing interest and understanding of architecture, art and science positioned him well within the community of scientific illustrators. As with others, Hayward was adept at creating an aesthetically appealing yet technically precise illustration. But the trait that really set him apart was the pleasure that he took in researching the science behind his assignments. In many respects, Hayward was as much a scientist as he was an artist. Published in 1938, Procedures in Experimental Physics marked the beginning of a new and prosperous chapter of Hayward’s unique career. During this period, scientific illustration would be the main focus of his energies, with architecture and the fine arts slipping well into the background. As his reputation grew, he found regular work with Scientific American, a popular science magazine, and was commonly sought out by professors at Caltech. It was during this time as well that Pauling became acquainted with Hayward. Not surprisingly, when Pauling needed to find an illustrator for his first college text book, his thoughts immediately turned to Hayward. Working with Pauling, however, was not the same as working with John Strong. Strong had such a high appreciation for Hayward’s work as both a scientist and an artist that he split royalties on basis of space coverage. This meant that Strong assigned as much monetary value to Hayward’s illustrations as he did to his other co-authors’ written work. Strong’s perspective, however, was rather unique and when Pauling first asked Hayward to illustrate General Chemistry, he did not expect the illustrations to cost as much as Hayward billed. Most scientists, including Pauling, believed that the training, research and experimentation from which a text results have more merit than do illustrations. Though he placed a premium on visual depictions, in Pauling’s mind it seemed fair to assign more value to the text than to the illustration. Pauling’s publisher, William Freeman of W.H. Freeman & Co., agreed with Pauling and referred to Hayward as “a bit of a prima donna” because he believed that Hayward overestimated the value of his work. In his correspondence with Pauling, Freeman also revealed that Hayward had regularly come into conflict with his firm over compensation issues. The company, however, continued to contract with Hayward simply because his illustrations were unsurpassed. After settling their differences, Pauling and Hayward began to bond over their similar interests. By then, John Strong had taken a position in Baltimore at Johns Hopkins University. His closest science-minded friend now on the other side of the country, Hayward increasingly came to use his connection with Pauling to further discussions on scientific advances. 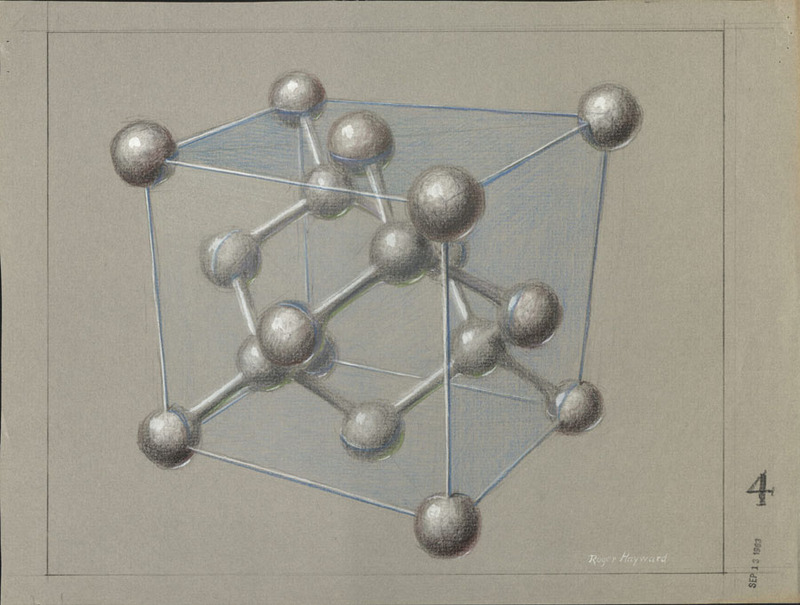 Hayward’s background as an artist and architect also enabled his exploration of three-dimensional molecular models, a pursuit of special affinity for Pauling, and once again, the two began discussing each other’s ideas. Pauling suggested that Hayward use models to convey recent findings in structural chemistry, especially regarding crystal structure. Gradually, through many conversations, Pauling too came to recognize Hayward as a scientist, rather than merely a skilled artist. The polymath Roger Hayward, a favorite of ours over the years, at last has a major web exhibit devoted to him that is worthy of his talents. 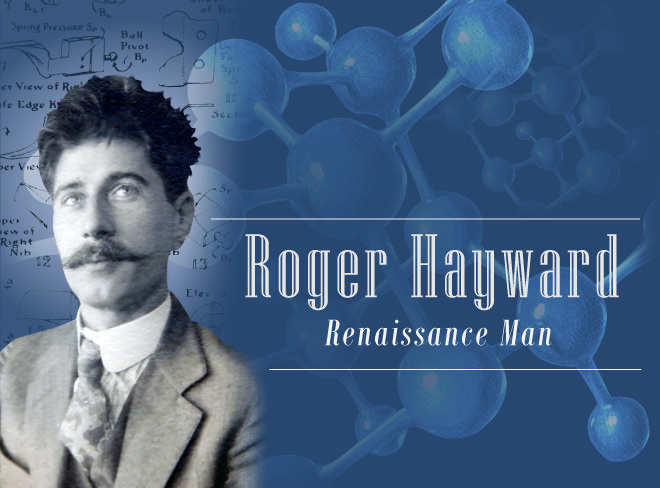 At forty-three chapters long and containing some 432 images, Roger Hayward: Renaissance Man is now the authoritative resource on Hayward’s remarkable life. For those unfamiliar with the Hayward story, here is some text from the official press release announcing the public launch of this exhibit. 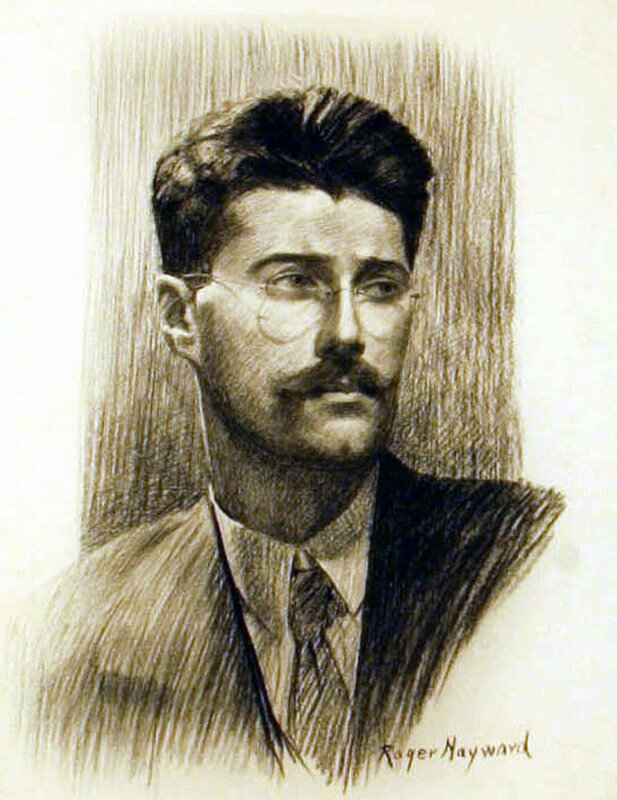 Born in New England just before the turn of the century, Hayward attended the Masschusetts Institute of Technology, where he graduated with honors in architecture. Despite having built a reputation in the Boston area as a talented fine artist as well, Hayward and his wife moved to southern California in the late 1920s, lured by the offer of a position as Chief Designer at the Los Angeles-based Cram & Ferguson architecture firm. With the stock market collapse of 1929 and the onset of the Great Depression, Hayward was forced to expand his skillset in order to make ends meet. His solutions to this dillema were an indication of the remarkable creativity that defined his professional life. For one, he crafted puppets and performed puppet shows in his home for a fee. 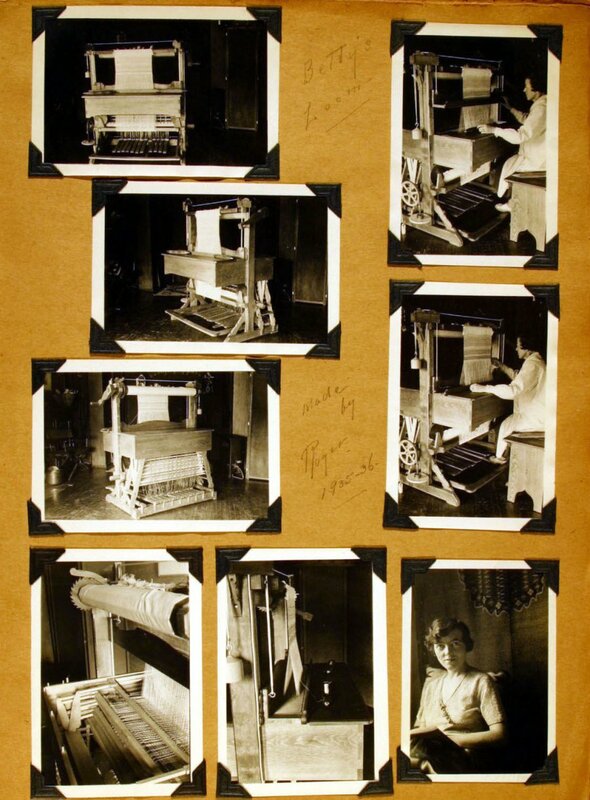 He also built three looms for his wife Betty, whose resulting textiles were sold at local markets. Indeed, Hayward’s ingenuity resulted in numerous patent applications over the course of his life for products ranging from fountain pens to nut crackers to baby bassinets. Over time, Hayward’s relationship with many scientists at the California Institute of Technology served to bolster his interest in the sciences. Hayward also worked on behalf of the United States government during World War II and became an expert on the subject of optics. He is now believed to have been a key contributor to the development of the Schmidt-Cassegrain telescope. Following the war, Hayward built a reputation as a scientific illustrator of great import, providing visuals for Scientific American‘s “Amateur Scientist” column for nearly twenty-five years and collaborating with Linus Pauling on numerous publications including 1964’s The Architecture of Molecules, for which Hayward served as co-author. The Roger Hayward Papers, upon which the exhibit is built, arrived in Oregon in circuitous fashion. Our first contact with the collection came in 2004 during which time our staff was conducting copyright research for the website It’s in the Blood! A Documentary History of Linus Pauling, Hemoglobin and Sickle Cell Anemia, which incorporated Hayward’s pastel drawings of both normal hemoglobin and sickled blood cells – drawings which reside in the Ava Helen and Linus Pauling Papers. At the time, the collection resided with members of the Hayward family living in eastern Canada. Impressed by the work that our department had done with the Pauling Papers and interested in adding to OSU’s corpus of materials related to Pauling, the family agreed, in 2009, to transfer the Hayward Papers more than 3,000 miles to our facility for final arrangement, description, preservation and access. 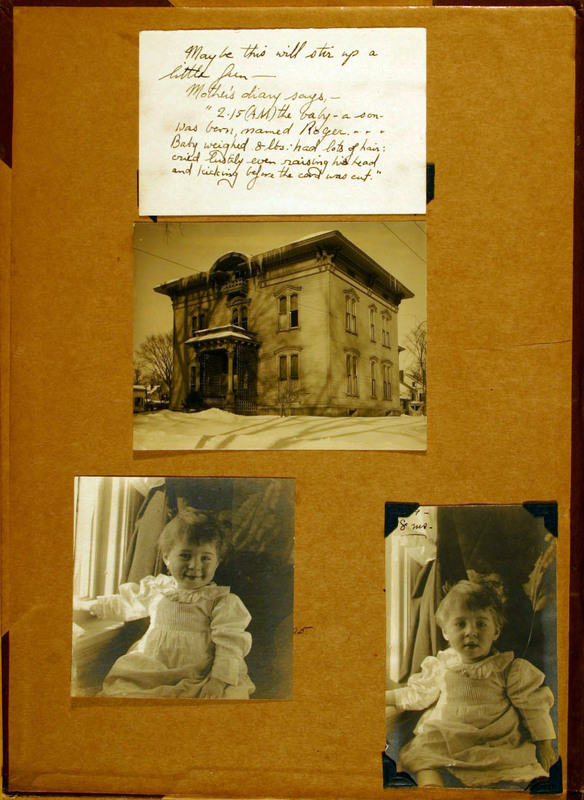 Page 1 of Hayward’s biographical scrapbook. What arrived was a treasure trove of letters, drawings, photographs and notes of all kinds, including ideas for new inventions and materials developed for the Allied war effort. Most extraordinary though was the Biographical Scrapbook that Roger meticulously kept over the course of his life. Chock full of revealing newspaper clippings, photographs and even original art works, the seventy-four page scrapbook is a prized possession among our collections and served as the source material for much of what is presented on the Hayward exhibit. 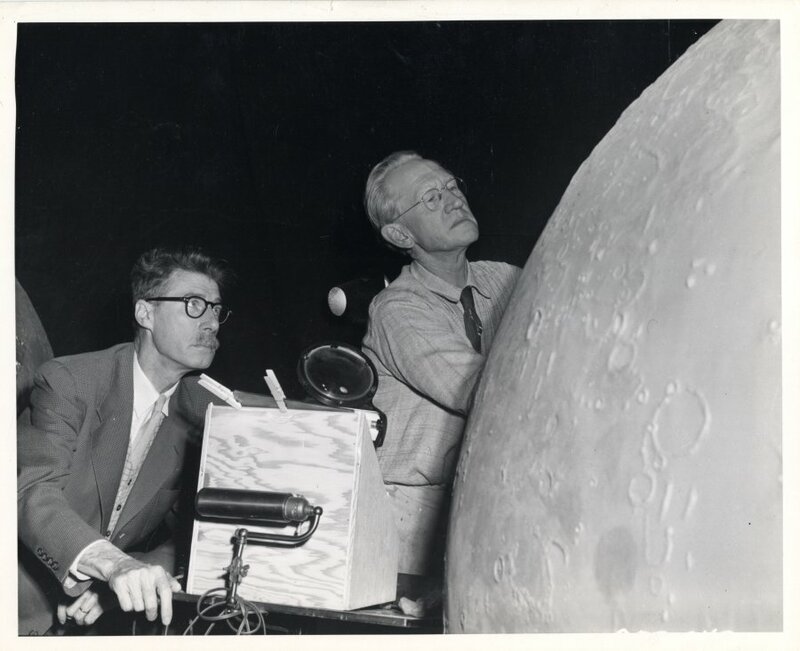 Hayward and Caspar Gruenfeld building a moon model, ca. 1934. The entire experience has been immensely gratifying for us and we are pleased now to present a web exhibit that might spur further inquiry into the life of an extraordinary personality, a true Renaissance Man. Self-portrait by Roger Hayward, ca. 1930s. In the archival world, scrapbooks are typically regarded to be “high-value” items, deserving of close descriptive and preservation attentions. As we work our way through the arrangement and description of the Roger Hayward Papers, we are reminded again as to why scrapbooks are held in such high regard. Though the Hayward Papers consist primarily of correspondence and sketch books, the collection’s lone biographical scrapbook is especially noteworthy for its inclusion of dozens of photographs, newspaper clippings and original art works that are not otherwise replicated elsewhere in the collection. Flipping through the pages, one is reminded that Hayward was much more than an illustrator noteworthy for having provided technical drawings for scientists the likes of Linus Pauling. Portrait of Betty Hayward, Roger's wife of fifty-seven years. Weaving looms designed and built by Roger in the mid-1930s for Betty's use. During the Depression, Betty's Navajo-inspired textiles helped contribute to the household income. 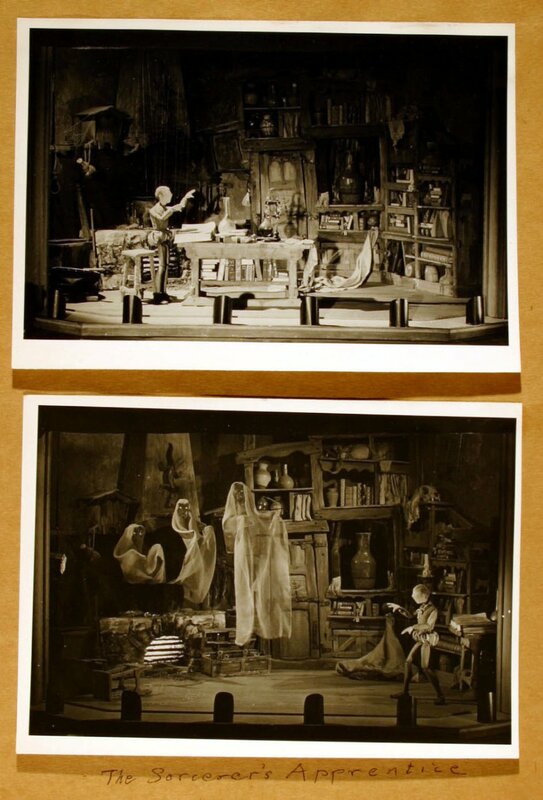 Roger, Betty and Roger's brother Julian also constructed puppets and staged puppet shows at their house and at the Caltech Atheneum - another source of income during hard times. Throughout his life, Roger maintained a keen interest in optics and would eventually hold four patents related to telescope design. 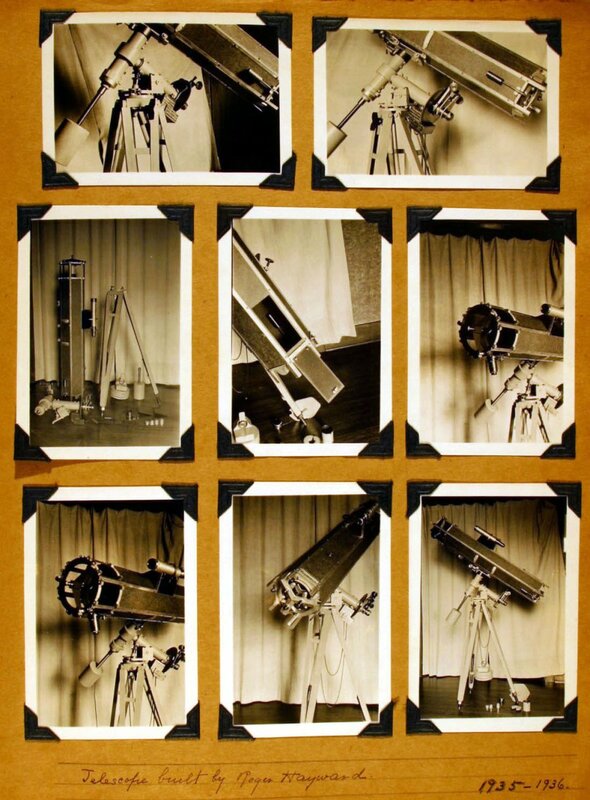 This is likely the first telescope that he built. Hayward to Sara Ross, Sept. 16, 1967, p. 1. Hayward to Sara Ross, Sept. 16, 1967, p. 2. 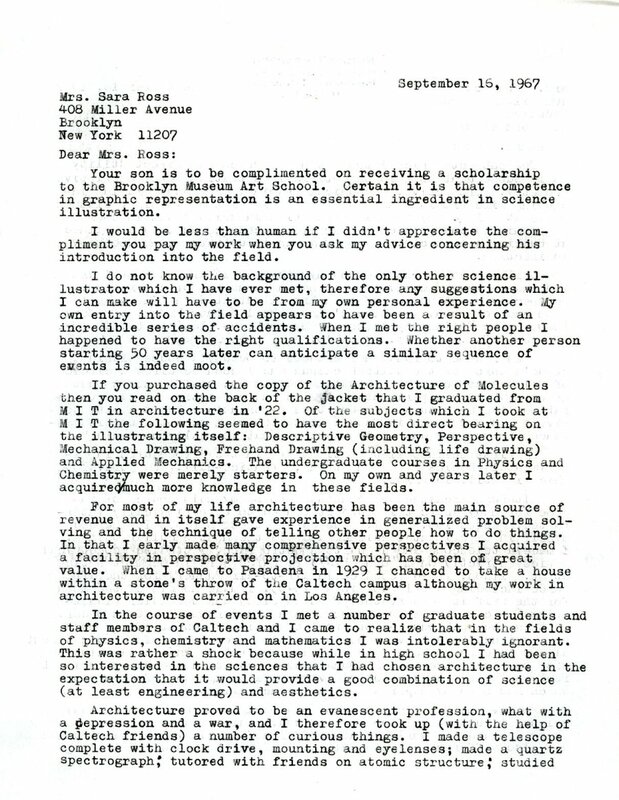 This two-page letter, written by Hayward in 1967 to a woman requesting career advice for her son, an aspiring artist, is a tidy example of Roger’s multiplicity of skills, including his facility with words. His career advice, and perhaps his philosophy of life, is neatly encapsulated near the end of the document. If there were available a course in ‘How to Learn’ it might be a good preparation for science illustrating. A next best subject might be the History of Science. I found ‘A History of Technology,’ edited by Singer Holmyard, Hall & Williams (Oxford, 1957) of some interest, at least through the first two volumes, but sense that the editors haven’t soiled their fingers by actually doing the things they write about. There is no substitute for doing things with your own hands. 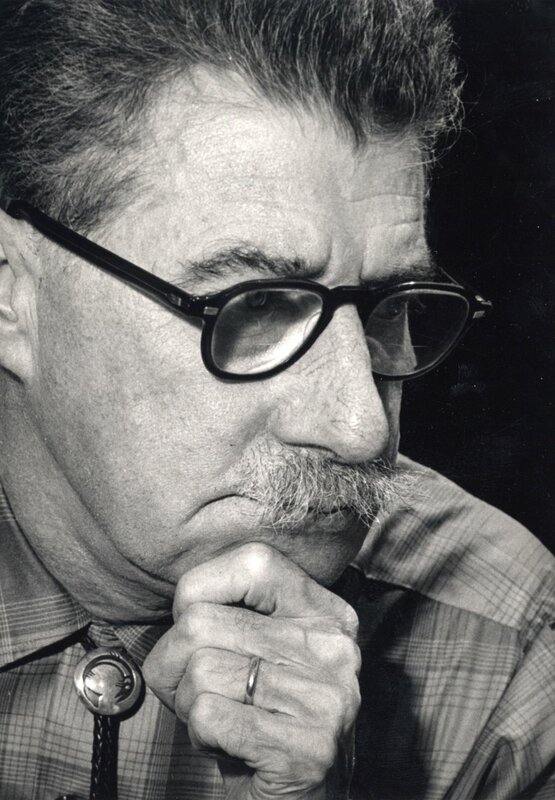 To learn more about Roger Hayward, see our blog series devoted to his life and work.